One of 30th Street Station's most familiar sounds may be extinct in just a couple of months. It's been more than two years since it was announced that the antique, clickety-clacking Amtrak board at 30th Street would be replaced by a digital one. Despite community pushback when the news was first announced in 2016, it seems the end date for the famous Solari board could be quite soon. The Pennsylvania Historical and Museum Commission, headquartered in Harrisburg, is set to acquire the board next next year, as early as January. Billy Penn reported that the museum's take over date is still subject to change, however, as the official agreement is still awaiting signatures. Once the sign does cross over, it will be on display at The Railroad Museum of Pennsylvania in Strasburg, Lancaster County. The 30th Street Amtrak sign is one of the last still in use in the United States. New Haven's Union Station was among the most recent to abandon its split-flap board. 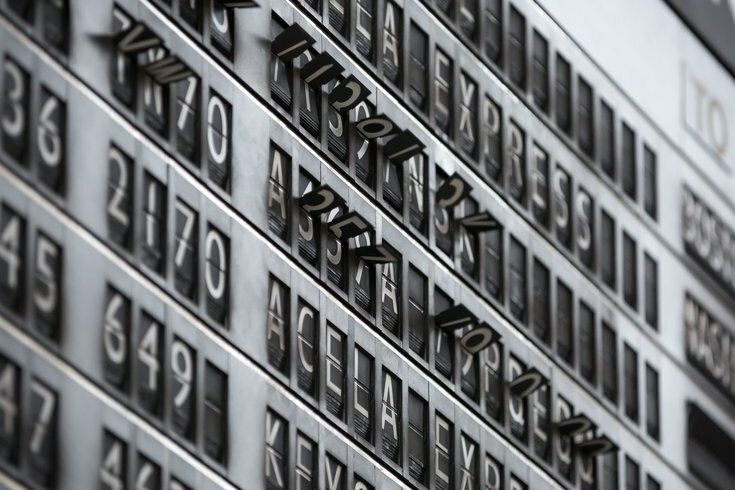 Nostalgia for those Solari signs, which boomed in popularity during the mid-20th century and was installed in Philadelphia during the 1970s, is real, though matched only by how dated its technology can be – often at the cost of commuters. Windows 95 still is need to keep the sign running today. Nonetheless, the clicking soundtrack to Philadelphia's arrivals and departures will be missed, though it's not the city's only one – Rittenhouse's new Shakespeare & Co. bookstore recently installed a smaller sign that changes every time a book is printed through the retailer. One Philadelphia company has an idea to keep 30th Street updated yet still maintain the nostalgia of the Solari board. Technically reported that Northeast's Oat Foundry – which makes similar signs for companies like Honeygrow and Air France – said it can help the station be technologically adept while still having that comfortable clicking sound. Oat Foundry's boards are controlled using Linux, which has API integration capabilities and can be maintained through a mobile app – decidedly not Windows 95. Besides the nostalgia, Oat Foundry CEO Mark Kuhn told Technically that the clacking sign is also a helpful alert so that people pay attention to the changing board. Plus, it's a nice reprieve from staring at a digital screen all day.